In Bollywood you cannot be a star unless you have a little bit of Dilip Kumar in you. 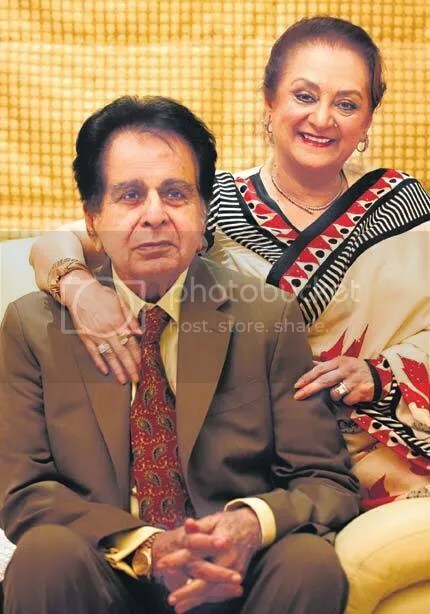 Peshawar-born Bollywood legends Dilip Kumar (Muhammad Yusuf Khan) and actress Saira Banu celebrated their 51st wedding anniversary on October 11, 2017 (watch video below). The celebrations, attended by only family members and close friends, were held at the couple’s Pali Hill residence in Mumbai. Dilip Kumar first movie was 1944 Jwar Bhata, and last 2007 Pellikaannee Pellam. In between those two Dilip Kumar acted in 60 films. On the other hand, Saira Banu acted in 42 films. Saira Banu born in 1944 to Bollywood actress Naseem Banu (Roshanara Begum, died 2002) married Dilip Kumar, 44, in 1966. Amitabh Bachchan, one of Bollywood’s highest paid actors, who has acted in more than 150 films, has worshipped Dilip Kumar as his idol and inspiration in acting since he started acting. He also said that he waited 46 years to get Dilip Kumar’s 93rd birthday in 2015. Bollywood icon Shahrukh Khan also idolizes Dilip Kumar. Bollywood/Hollywood actress Priyanka Chopra is also a fan of Dilip Kumar. Dilip Kumar, 95, was the first actor to receive a Filmfare Best Actor Award and holds the record for most number of Filmfare Awards won for that category. In 2010, Dilip Kumar’s Pali Hill residence where he had lived with wife for decades was taken to court by Shrayans Developers who were hired by the actor to redevelop the property into a multi-storey luxurious apartment building and a museum dedicated to his Bollywood career. The contract was signed in 2006 but due to lack of progress, Dilip Kumar canceled the contract and hired Black Rock Company in 2010 to do the work. Last month, Indian Supreme Court ordered Dilip Kumar to pay Rs 20 crore to Shrayans Developers in order to reposes the property which he did.